Falcon’s new Rotogang is now out and the word is, the company has got it right. Joe Spencer reports. The latest Falcon Rotogang, complete with safety guards. After all the recent columns highlighting the products of overseas manufacturers it’s gratifying to be able to write about a South African operation that can compete with the best in the world. More than that, Howick-based Falcon Agricultural Equipment has just released its latest Rotogang mower – and the company’s research and development team has hit the nail on the head. 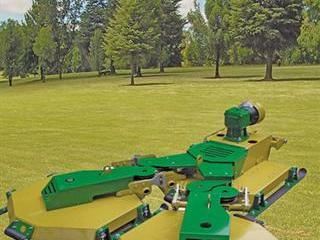 The Rotagang is designed for close cutting of fairways, sports fields and parks. 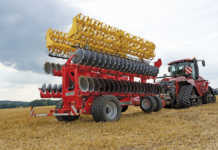 It can handle undulating terrain, requires minimum maintenance and can operate behind a small tractor. 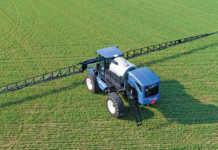 It’s proved to be an ideal implement for its intended market. The new design is lighter, but stronger, thanks to the monocoque construction. Anti-scalping rollers have been added to provide increased protection to the valuable turf on undulating fairways. The original concept that permits the separate decks to articulate without altering the tension on the drive belts has been retained and the belts are properly guarded. As with all new developments at Falcon, the mower was extensively tested in the field to ensure it met all the required parameters. The new product has all the features of the original, but with a much neater and aesthetically attractive appearance. Falcon’s dedication to efficient design and competent construction will ensure that these implements will be around for many years to come. Two new small Falcon blower mowers have also been launched, with the F25/90BM available for the smallest tractors and a 1,2m model built after customer requests. Other projects currently in the final stages of development include a 3m slasher with an innovative drive train, while the cost-effective Locust L180 1,8m slasher is now in production after intensive field testing. It’s much more efficient and cost-effective to develop an idea on a digital drawing board with 3D modelling capabilities than by trial and error in the fabrication shop. These digital prototypes can be used to assess things such as probable cost and customer response. The prototypes can even be animated to simulate actual operation. 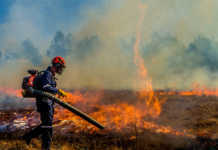 Using these state-of-the-art computer programmes is one of the factors that gives Falcon the edge.It has also upgraded its website www.falconequipment.co.za. Product information is more in-depth, directions as to where products can be purchased in each area of the country are given and news of all new developments is regularly updated. The Rotagang was invented many years ago as the Rota-sled and enjoyed great success in the field. But it proved almost impossible to manufacture the unit economically in its original format. Over the years, the cost of building a unit with such a multitude of small parts, all welded together, became prohibitive. The aim of the Falcon team was to come up with a new design, incorporating the main features of the original, but in a practical and economical form with a more effective layout.